The Tepee, (also tipi, tepe, tipee or teepee) was a typical structure used as a shelter or house style that was built by many tribes of the Great Plains cultural group who made them their homes. 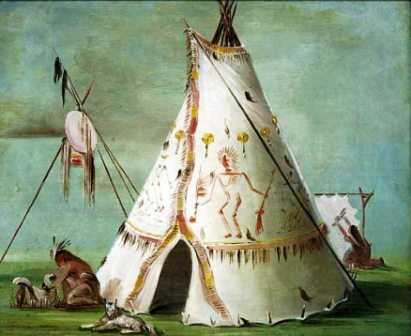 Learn about the structure and the interior of the Tepee with pictures and images together with facts and information about the tribes who used them, including the Sioux, Blackfoot and the Cheyenne. 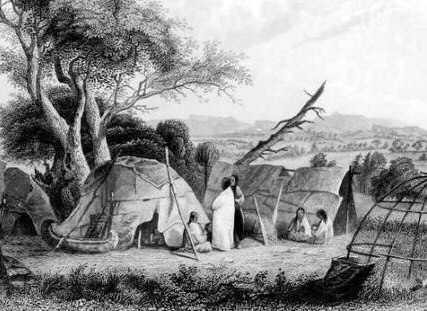 The Tepee was used as a home for many tribes. It was constructed by using the natural resources that were available to the people. The tepee was also used to house important ceremonies and meetings, and was able to easily accommodate over 50 Native Indians. The Crow and Sioux tribes were known to erect huge tepees for their ceremonies, meetings and rituals. The picture, by George Catlin, was sketched in 1832 and depicts a grand feast organised by the Sioux tribe and attended by the artist and Major Sanford, the Indian agent. The picture provides and indication of the size of the tepees that were erected for this occasion. Not all tribes set out their tepees in a circle. The tepee lodges in some villages were pitched in regular streets and squares, which allowed for easy movement of their horses. 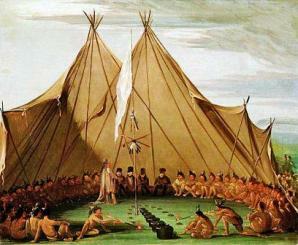 The picture of the Comanche Village was painted by the famous artist George Catlin (1796-1872) in 1834. 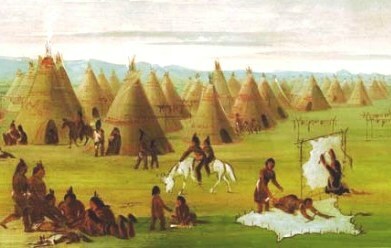 George Catlin described the painting of the village as only a small portion of the whole, which was the same in every part. He stated that the tepee village consisting of six or eight hundred skin-covered lodges, made of poles and buffalo skins that was home to thousands of people with horses and dogs. 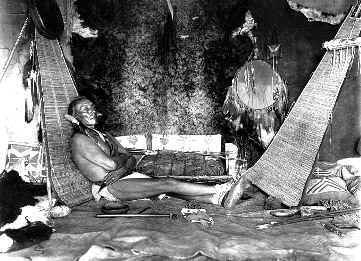 The tribe were busy with domestic occupations such as drying meat, and ‘graining’ buffalo robes”.